Any effective fat loss regimen includes a good workout protocol and proper nutrition. But even with proper diet and exercise, you may still feel like there’s something missing. Few things are as frustrating as feeling like you’re putting in the work and not seeing the results you’re after. If you’re working out and eating right, but feel like you’re coming up just short of reaching your fat burning goals, there may be something more you can do. An L-carnitine supplement for women can help provide the edge your body needs to optimize your fat burning potential! L-carnitine is a compound formed by a combination of 2 amino acids that occurs naturally within your body which can be obtained in small amounts when you eat red meat and dairy products, and can also be taken as a supplement. Among the primary roles of L-carnitine within your body is to help facilitate the conversion of fat into a usable fuel your muscles can rely on for energy during your workouts. There are multiple sources your body can turn to for energy during the activities of daily life. The first source your body relies on is carbohydrates because they’re more readily available. But your body can also draw upon its fat stores. Fatty acids can be broken down and oxidized for use as energy during your workout and as you go about your day to day life. That's where L-carnitine comes into play. L-carnitine helps your body to more effectively use fat as its preferred energy source. Supplementing with L-carnitine can allow fatty acids to be more readily oxidized and metabolized, providing the fuel your body burns when you exercise. Whether you’re aiming to lose a substantial amount of weight or trying to shed those last 5 stubborn pounds, being able to target your fat stores is essential. You can do cardio for hours until all your carbs are burned and your body has no choice but to burn fat. However, there is a better way. When you’re trying to lose weight, develop well-toned muscles, and get lean, being able to efficiently burn fat is a key to achieving your fitness goals. L-carnitine can be the ideal sidekick on your fitness journey! Fat loss is a tricky process, and as women we have a much harder time losing fat than men. Because of how our bodies hold onto excess fat, we need a little extra help banishing it for good. Incorporating a L-Carnitine supplement into your daily diet will provide you with the tools to continue to fight the fat! 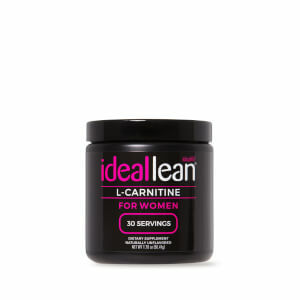 IdealLean's L-Carnitine supplement contains 1500mg of the most effective pure fat burning source for natural energy and the best possible results to match your hard work. Because L-Carnitine naturally occurs in the body, your body will recognize it and use it optimally. Say goodbye to that stubborn fat! With IdealFit on your side, your ideal self is just a jab away. 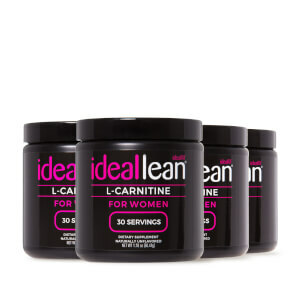 Can I view IdealLean L-Carnitine's nutrition facts? L-Carnitine is best used when taken first thing in the morning on an empty stomach or mixed in with another IdealLean product. What flavor is the L-Carnitine powder? Our L-Carnitine powder is tasteless in order for it to be easily added to any liquid without altering the taste. Is this product a pill or a powder? Why does the powder smell sweet? In order to provide the customer with a pleasant smell we added natural masking agents in order to achieve a tasteless powder. What is the bag that comes inside of the bottle? This bag is put there in order to prevent moisture from entering the bottle and to keep your product fresh. How much L-Carnitine can I take per day? Studies have shown L-Carnitine supplemented up to 2-3 grams per day. Some other products I’m taking contain L-Carnitine. Is it safe to take them all? 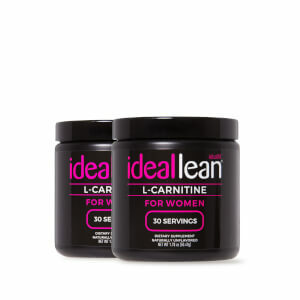 IdealLean L-Carnitine is safe to be supplemented with all IdealLean products. What are the benefits of stacking this product with CLA? CLA is known to be a natural fat burner just like L-Carnitine. L-Carnitine aids in transporting fatty acids to be used as energy while CLA decreases the melting point of fat making it easier to burn. How does L-Carnitine aid in fat loss? L-Carnitine helps to transport fatty acids into the mitochondria to be used as energy, or be burned as fuel. Is this product going to make me sweat more? No. This product is a non-stimulant. Will I get jittery when taking this product? No. This product is not stimulatory.